Layering emergency notifications is the concept of distributing these notifications across multiple platforms and mediums. The goal of this is two-fold. First, it maximizes the number of people who are exposed to the message by reaching out across multiple platforms. And second, in maximizing the visibility of the message, it emphasizes the seriousness of the security situation at hand. Essentially, reinforcement encourages recipients of the emergency notification not just to listen, but to take the appropriate response, which should also be included in the message. So what exactly are the platforms and mediums that are best for layering the distribution of emergency notifications? The best is a mix of old and new technology. This ensures that no matter where an intended recipient is, or what kind of technology they may or may not have on them (e.g. smartphones), that the chances they receive the message are maximized. Learn more about how to layer emergency notifications in our blog. Layering helps ensure that emergency notification messages are received. These days, smartphones are often the primary distribution channel for emergency notifications. Texts and emails can be sent instantly en masse. Many smartphone users check their devices frequently, making this notification system ideal. Another benefit of this system is that it also alerts people who are not on the premises or campus, ensuring that they stay away while a security event is in progress. Updates on the situation can also be sent in real time. Social media offers another virtual communication channel for emergency notifications. The best part about social media is that it offers a platform for two-way communication between security personnel and concerned citizens. Desktop notifications can be sent to all desktop computers on the network in order to alert users. Traditional public address systems are still an important part of any emergency notifications system. Learn more about public address systems in our blog. Digital signs are used on many campuses as an informational resource. 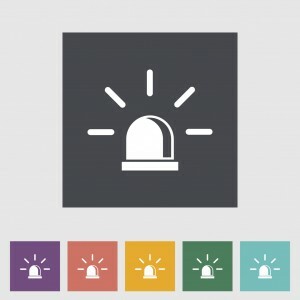 During security events, they can be used as another layer of the emergency notifications system. Emergency call boxes placed throughout a campus can be integrated with other security solutions, and serve as an important communication access point during security events. New fire panels use digital tablets to display building layouts and exit points. This entry was posted on Thursday, June 25th, 2015 at 1:21 pm. Both comments and pings are currently closed.